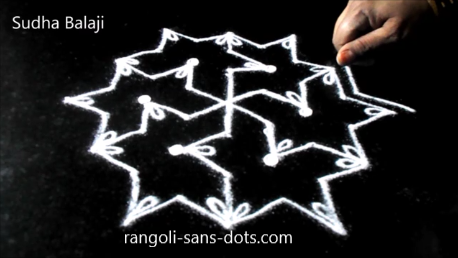 This is a somewhat complicated rangoli design though the dot pattern is only 7 dots. 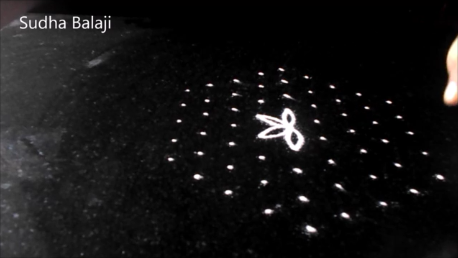 It is not exactly a 7 dot design the actual dot grid is 7 dots at the centre then 6,7,4,1 on either side. 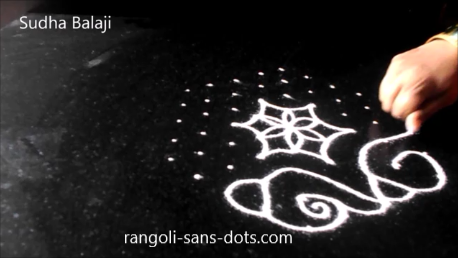 The images show the steps for the rangoli . I have added many pics so that it is easy to understand. 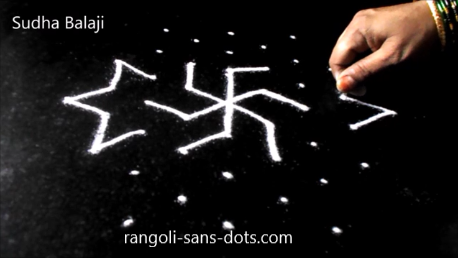 This is a very apt rangoli to fill colours. 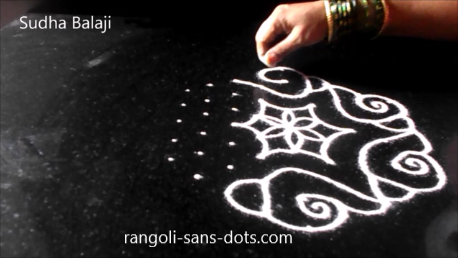 We can use different or same colours in alternate patterns to get a beautiful rangoli for Diwali decor of our homes. 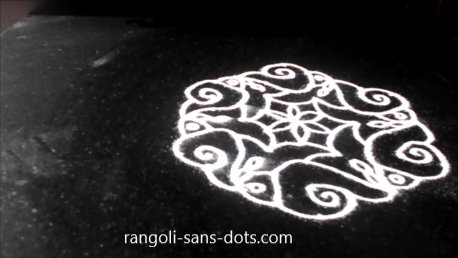 This is a traditional rangoli design using shankh patterns that is drawn regularly for festivals like New Year and Sankranthi. 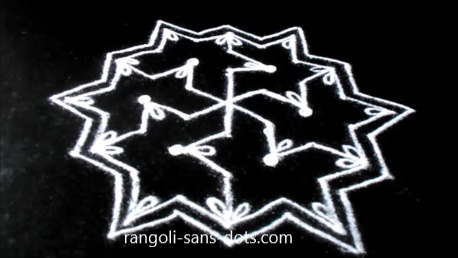 I wanted to offer something different for Diwali instead of the patterns with lines connected by dots, so this rangoli. 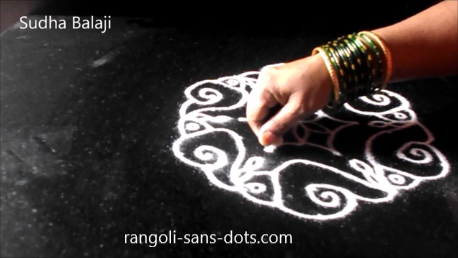 The beauty of the rangoli depends of the way we connect the curved lines of the conch designs through the dots so that we get a near perfect pattern . 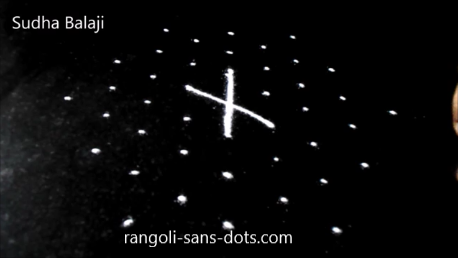 The dot grid used is 9 by 5. Usually this is the centre design for a bigger rangoli for Sankranti or Pongal ! 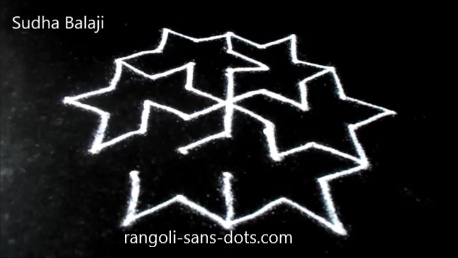 I have restricted it at this step due to shortage of space for me and also because I am of the opinion the beauty and attraction in a rangoli does not depend only on the size of the design.